"Providing specialized books and resources for modelers of every genre." From DREAM . . .to DRAWING. . .to FINISHED PROJECT! NOTE: Messages can sometimes be blocked by your Internet Service Provider's e-mail filters. To ensure you receive an e-mail confirmation of your order and are notified when it has been shipped, please be sure your e-mail is configured to accept all messages from ModelersNotebook.com. 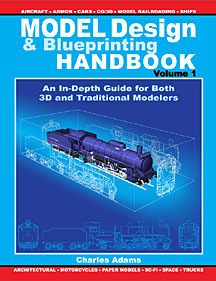 The MODEL DESIGN & BLUEPRINTING HANDBOOK, Volume 1, is priced at $34.95 + $5.16 Shipping & Handling in the Continental US ONLY* Orders are shipped via Media Mail and delivery takes 2-9 days (packages may take longer to reach Alaska and Hawaii). For orders shipped to APO and FPO military addresses, US Protectorates, or anywhere else, please go here. Click the "Buy Now" button to purchase 1 book using a major credit card**. NOTE: If you wish to purchase 2 or more books at one time, or if you wish to pay by USPS or Domestic Money Order, please e-mail us for instructions on how to order. *Please note we cannot process online orders from residents of WASHINGTON STATE here on this page. You may order by clicking here. We do our best to process most online orders within 1 business day. You will receive a confirmation message via e-mail when your order has been received, and a second message when your order has been shipped. **We accept all major credit cards for online payments. Our website payment system is powered by PayPal, a company owned by eBay. This online service is safe, convenient, and highly secure. You do not need a PayPal account to pay with your credit card. Simply provide your credit card information at checkout. We do not record or store any payment information -- everything is handled by PayPal's secure servers. resources for modelers as they become available. *If you have purchased from us online, your name has already been added.